The Air Mentor PRO is a very good air quality monitor. It's not perfect for everyone but it can do an acceptable job for many. If you just need a unit to tell you about the air you're breathing, then you cannot go wrong with the Air Mentor. The Air Mentor Pro A is an example of a big thing coming in a small package. This device comes in a compact unit but it packs a punch in whatever it can do. This air quality monitor comes with a can detect concentrations of CO2, VOC along with CO, PM2.5 and PM10, temperature and relative humidity. 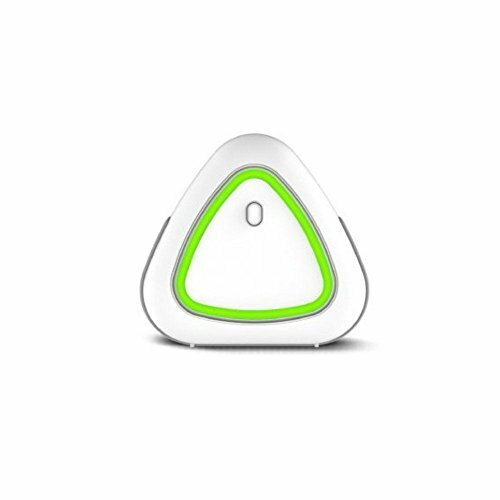 It has an LED bevel designed to change color to indicate air quality levels. This simple design makes it very easy to understand and use. The Air Mentor has a companion Air Mentor mobile app to control the unit. This app is available for Android and iOS devices. Here, you will find all the expanded readings of the air conditions including historical data. This is stored in the cloud so that you can always retrieve it later even from another mobile device. The unit connects to the mobile device via Bluetooth. It does not have WiFi. It is clear that the makers of this air quality monitor decided to focus on ease of use. Starting from the LED indicator that changes color requiring very little interpretation, to connection to the app which takes only 2 steps. One only needs to glance at the monitor to know whether air quality is good or bad. The mobile app is tasked with the details explaining why. The Air Mentor isn’t super accurate. Neither does it claim to be. It however gives you a good idea of the state of your air. The inbuilt battery means that you can move around with it and have a general sense of the air quality of the places you visit. Since it doesn’t use the power hungry WiFi, the charge lasts a couple of days. This is a great monitor no doubt about it. However, it goes without say that it’s not right for everyone. It’s good for those who are happy enough with ballpark level accuracy and no need for WiFi. Basically if you just need a general idea of what air conditions are like. It is not a good buy for anyone that needs WiFi connectivity or connections with smart devices around the house.